Welcome to Clarke & Sampson - an independent insurance agency headquartered in Alexandria, Virginia. We’ve proudly served generations of individuals, families, and businesses since 1946 with insurance coverage to help them live, work, and enjoy life with confidence. We provide a full range of both commercial and personal insurance products. Because we are an independent agency representing a broad range of national, regional and international insurance companies, we are able to provide you with coverage tailored to your needs – something you simply cannot get from a large national insurance company. Many companies can “sell” you insurance. But what happens after that? At Clarke & Sampson, insurance is just the beginning. Our team’s ongoing attention, expert guidance and responsiveness to your needs make all the difference. And don’t just take our word for it: read what our customers say about us! Our goal is to exceed your expectations and bring a professional standard into the insurance market place that is unmatched. 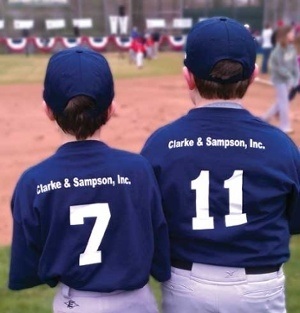 No business is too big or too small for Clarke & Sampson. Each client is equally important and we are dedicated to providing a full range insurance products and outstanding service to every customer, every time. Our agents will review your current coverage, provide you with expert advice and recommend insurance options tailored to your needs. Our goal is to make sure you get the best insurance products for the best value along with our commitment to provide you with a highly personal level of service. Contact us today or request a quote now using the link below. Clarke & Sampson was originally established as the F.W. Clarke Company in 1946 in historic Old Town Alexandria, VA. A few years later, Everette R. Clarke and Jack Sampson joined the firm and the company became Clarke & Sampson, Inc. At that time, Clarke & Sampson served as a local insurance agency primarily providing home and auto insurance. Steadfast to core principals of trust and integrity, Clarke & Sampson now serves clients in all 50 states and internationally. A third-generation independent insurance and real estate agency, we take great pride in our stellar customer service, commitment to the community and the respect we have earned over our 70 years of service -- including winning the esteemed title of “Business of the Year,” from the Alexandria Chamber of Commerce. At Clarke & Sampson we are built upon a solid foundation with a clear vision of who we are and where we’re going. Maintaining our independence when so many other insurances agencies have sold to large national agency or banks is the critical difference for today’s consumers.